Wonder Valley, CA: Cleanup money coming soon! Money to clean up illegal dumping in Wonder Valley! Mark Lundquist, the chair of the MAC informed me that the San Bernardino County Board of Supervisors will be releasing funds for desert cleanup. Community member Almut Fleck suggested asking everyone to send in potential cleanup sites, so we'll have our list and are ready to go when the resources come. Thanks, Almut! Great idea! Send the address or intersection, a description, and attach photos if you like. I'm working on a waste resources tab at the top of this page - we can make it into a flyer and make sure everyone has a copy. 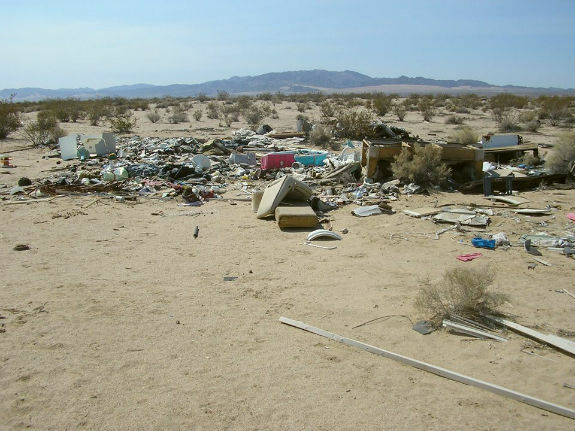 Getting rid of stuff out in the desert isn't as easy as it is in the city, so if we all know how and where to get rid of things we can all have a part in keeping the desert clean.